Spreading democracy one cup at a time. Photo courtesy of Victoria Lee. They may take our (tea)leaves, but they’ll never take our freedom! This machine does not dispense oppressor coffee. 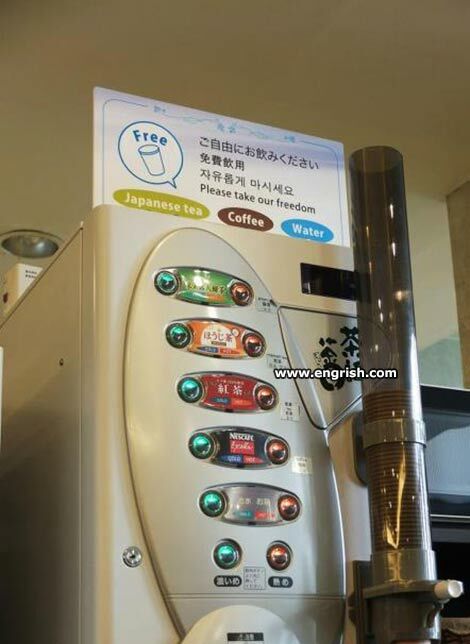 This machine serves both Espresso, Deeppresso, and Oppresso. I for one welcome our vending machine overlords. It happened in Czechoslovakia, and the people there thought it couldn’t. If you believe it can’t happen here, you have serious delusions..
Next week we annex the sandwich vending machine. Do you have the same “SCHEIN” ad to the right of this topic, as I do. The fourth button down, looks like it says NITROL – C3H5N3O9. Now there’s a drink which will put hairs on your chest. When the Vending Machine punches your buttons, it’s too late. @Marum | 5:08 am: Whatever that SCHEIN thing is, it must relate to some site you have visited online recently. Aside from the Engrish ads, they seem to be individually tailored. I’m seeing ads from Gearbest as I was looking at some of their merchandise lately. The 2 girls I mentioned are to go with the 1 (free) cup. @Marum | 5:11 am: And remove them just as fast! Our average internet speed on the NBN (National Broadband Nutwork) is 10Mps. I am achieving 72Mps on single channel WiFi. I could do better, but as I don’t download movies, or watch TV online, it is sufficient. (Two channels would get me close to 150Mps. Our download speed, makes us about 50th in the world. Nice one 99. New option coming soon: Captive-chino. Anybody else getting WWII flashbacks? Did I mention, politicians not knowing what they are talking about? Old adage: It is better to be quiet and have people think you are a fool, than to open your mouth and dispel all doubt. @Classic Steve | 7:06 am: Nice link! I enjoyed that mashup. @Pete. I realize you don’t speak German, but I thought you might recognize the old Nazi marching song. That’s how they get you: free samples until you are addicted, THEN they charge any amount they want. You’re hooked and have lost your freedom. I though it was; the ranks close together, instead of; the ranks tightly closed.